It won’t be a shocking discovery if I write that that digital technology dramatically changed the art of photography. Travel photography gained (or lost?) the most, since digital equipment freed this art form from being a domain of experts. Now every traveler becomes an author of a potential artwork, and has the means to publish it on social media platforms and photography communities websites. Such a transformation from analog to digital photography and its wide accessibility poses many questions. 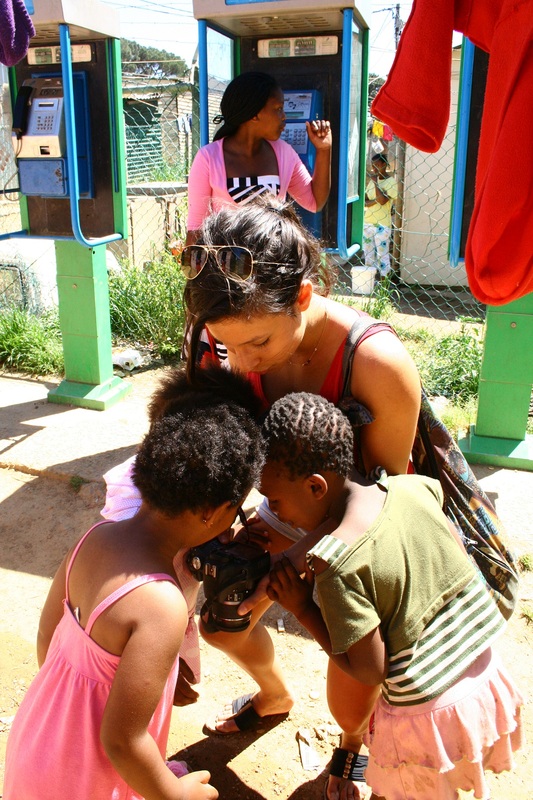 Spending a few months in South Africa made me wonder about one question in particular: what does the digitalization of photography mean for relationship between a traveler and a local community? The exotic, faraway places were always the most tempting ones. Since the beginning of colonization era, or even before, travelers had the romantic idea to travel to places nobody has ever been to, and lift the veil of mystery by bringing back local objects, lengthy descriptions in their notebooks, artworks, samples of unusual plants, and even people. Nowadays we don’t need to bring back a suitcase full of rocks (although we still do) or drag a few local children back with us on a plane. Thousands of photographs piled up on a hard disc are our proof that we’ve been there, and our way to show the exotics of the place to those who stayed. And the locals are not the only focus of the photograph. The internet is filled with pictures of the travelers with the locals, especially with children. Such a pretty image fits well into a cliché narrative of a European missionary helping poor African children. Let’s now move on to my own experience with photographing poverty. My hunt began the moment I stepped out of the Cape Town International airport, but it wasn’t until my visit to a township, Kayamandi, that I started feeling uncomfortable with the camera. Poverty, lack of running water, and provisional shacks made a huge impression, even though life conditions in Kayamandi are considered one of the best among all South African townships. Me and my friend were walking the dusty roads with two black, 14 year old girls from the afterschool program. Even with them we drove much attention because of the color of our skin. While my friend was taking pictures of everything and everyone, I was hiding my camera and taking pictures only by sticking the lens out of my bag just a tiny bit. I wasn’t afraid of it being stolen. I was more concerned that taking a photo of a woman sitting in front of her shack I would acknowledge that she and her house are merely a tourist attraction. That the color of her skin with the shabby surrounding make up a nice, picturesque image that I, the white tourist apparently displaced in this black neighborhood, would take home and show proudly to my friends. I would admit that her misery is a perfect subject of my indifferent photographic exploration. My grandmother, having browsed through my photos from South Africa on facebook (yes, my grandmother on facebook! ), asked me “where are the photos of the locals? And the children?” Travelling the way she does, in a touristic bus to Egypt or Greece, it is easy to take photos of whatever and whomever she likes. Not only are the locals used to touristic masses looking at them through the lenses of their Canons, but the tourists themselves are also safely hidden behind bus windows. This spacial distance and the clear tourist-local division make it possible to take a picture without feeling guilty. And even if you do, a second later a photographed person will disappear behind a bus anyway. I feel that in South Africa it is much different. Not only don’t I have the protection of a touristic bus, having to face people directly if I want to steal their souls, but the racial issues create tension so tangible that I feel embarrassed taking my camera out. The racial inequality and a recent history of apartheid adds another, nasty hierarchical dimension to the relationship between a photographer and the subject. However, that does not count for children. These still innocent creatures were running happy around us, holding our hands. Besides, seeing their faces on a small LCD screen on the photo camera is a pure joy for them. It seems that, in some cases, the digital technology can actually facilitate a non-verbal communication between the traveler and a local. Sontag, Susan (2004). Regarding the pain of others. London: Penguin Books Inc.